Working in conjunction with swimmers and coaches to develop our products we have now improved the design of our Maxi Swimming Lane by increasing its buoyancy in the water. As a result it offers a more effective swimming lane by providing a much greater barrier against waves created by swimmers. To create the new swimming lane, tooling was modified and floats added at every Maxi Disc along the length of the lane line. Click here to view the Maxi Swimming Lane. 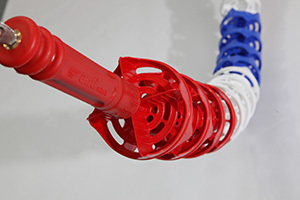 Click here to view our Swimming Lane Range.